THR was the first to report on the news, which comes just before the release of Solo: A Star Wars Story – it opens in theaters tonight. Although these spinoffs were meant to tell stories outside of the Skywalker saga and away from the tales of a Jedi, Disney and Lucasfilm are developing an Obi-Wan Kenobi movie, which would be directed by Stephen Daldry. There are no writers attached to that script, as of yet. There have also been rumors of a Yoda standalone being in the works. Although, that has yet to be confirmed. 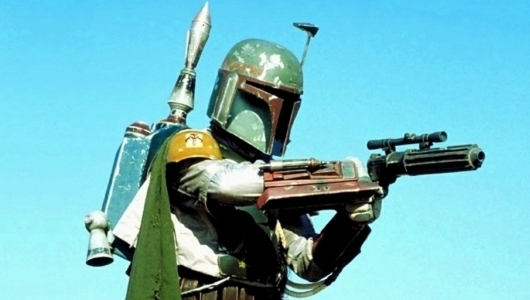 But this wouldn’t be the first time that we’ve heard of a Boba Fett movie in the works. Back when these spinoffs were first announced, Josh Trank was attached to direct a rumored Boba Fett spinoff. However, plans for that fell through when Trank’s behind-the-scenes and on-set troubles on the Fantastic Four reboot started to leak. X-Men producer Simon Kinberg was also attached to the film before it got put on hold. Kinberg and Mangold have worked closely together in the past, having recently collaborated on Logan. Kinberg also worked with Disney in the past, having produced the Cinderella remake. Though Boba Fett has very little screen time in The Empire Strikes Back and Return of the Jedi, he had a silent demeanor that established a deadly persona. A Mandalorian, Fett was equipped with a traditional blaster, wrist-bound flamethrower, and rocket launcher that was attached to his jetpack. However, we never saw him without his a t-shaped visor helmet – that is unless you are counting Attack of the Clones. And yet, despite his limited appearances, he has reached a cult status. Which is why he is getting his own spinoff. No word yet on what the film could be about or when it will be released. Although, that kind of information will come out soon enough. Let’s just hope there are fewer troubles on this spinoff than the last two. Whether or not this will relate to either of the other spinoffs like Solo or Rogue One remains to be seen. It only makes sense since the two work in the criminal underworld. The two definitely have a history. And it’d be quite fun to see that be fleshed out in the spinoffs. Mangold is best known for writing and directing the Academy Award-nominated Logan, and The Wolverine as well as the Academy Award-winning Walk the Line. Other credits include Knight and Day and 3:10 To Yuma.